Ada and Darcy: Fancy coming over? Luke has started building my deck! To celebrate it's completion (no actual idea when that will be) we will hold a lovely dinner party. The food might not be perfect (cooking is certainly not my forte), i hope the decor and styling may make up for my cooking skills! Wow! Nobody would even notice the food. I absolutely love this and the colours! I have added your blog to my links to keep visiting. Oh yes please ... really lovely. (that lemon dessert in the pic looks delish too)! I'm coming over for dinner....the table looks soooo inviting....thanks for popping over to me...was that a little play on words about looking for a nice chest ??!!!! I adore all these bright colors! I'm sure that it will be a smashing success. 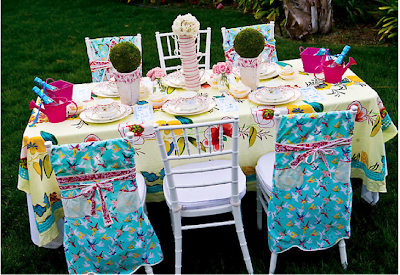 Cooking is not my forte either, but I think you'll find something easy and fun... dinner parties outside can be so pretty! Love those fabrics on the chair and table! yes please, i'll take the first (fast!!) flight over there! I'm sure that with your wonderful sense of style you will create an inspiring place of celebration. We will all look foward to seeing it in the future. Food, schmood! As long as the setting looks this lovely, dinner will be a blur. Ooh, yes. What time? I'll bring the crumpets! Lovely styling! The colors are so great! What a wonderful world of colors!!!!! I must say that this looks so beautiful...the colors are amazing...i love brights and mixed patterns..on that white table...so fresh...i know yours will be just as lovely. Ooh I love this!!! Such fun!! every detail is so special. I love the red ribbon tied around the chairs!! 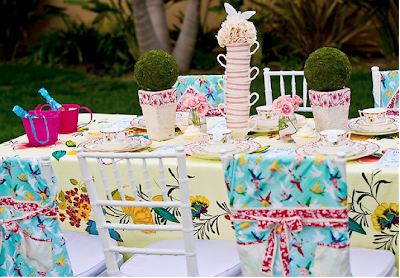 the bird fabric on the chairs is enchanting!! congrats on your deck! Congrats on the building of a new deck!! It will be so lovely when it's done! What beautiful festive table decorations! 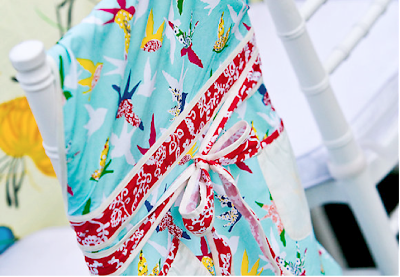 I adore the aprons as chair covers. Lovely! Makes me want to host a outdoor gathering too! Have fun! Wow this is so pretty! I'm with you - I'd much rather decorate for a party than cook. Who needs food when you can just admire all this loveliness. Just say when - I'll be over with petit fours and champagne! Oh, I'll come over. It's gorgeous..., and would be perfectly happy just sipping a little chilled wine. Ooooh! Sooo pretty! I love the pink spray roses and the topiaries. 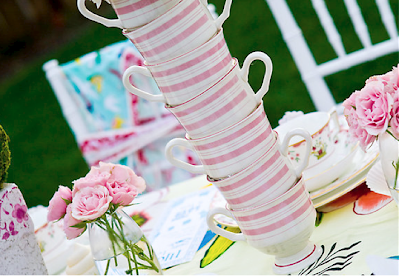 great idea with the teacups too. Just full of happiness. :) Oh, forgot to mention the cupcakes! Love everything about this table! 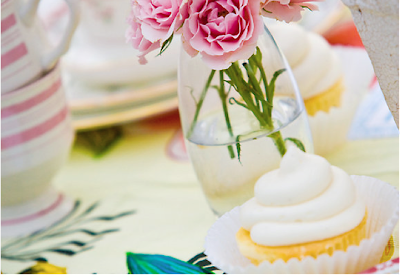 wouldn't it be perfect for a little girl's tea party? 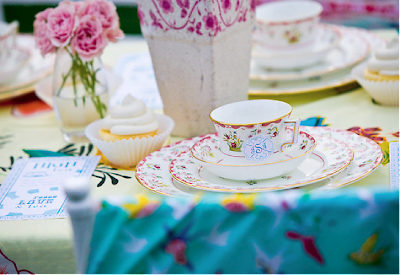 I'm on my way...can we drink bubbly from the pretty little teacups? So glad that I found your blog. And of course, I love the name. :) Beautiful post - I will be back! I am all about a pretty table, this one is gorgoeus! 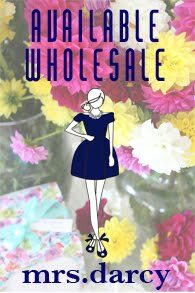 What wonderful, fun pictures, love them, so glad I found your blog, what an inspiration, Thank You. I will be visiting your blog often it is great. Cheery, summery & delightful. What could be better. You could serve crackers & water in this setting & no one notice or care!!! Good luck with the construction!!! Love your blog every day more and more! This post is fabulous! Cngratulations you won two awards!!!!! stop by to collect! Hope you are having a great Wednesday! Looks so fun and pretty! The colors are amazing. You will have to take pictures of your party and share with us. That is a stunning party! If yours hits even close to this mark I am sure it will be brilliant! Way to celebrate a new deck... We'll all want to see pictures when it is completed I am sure! 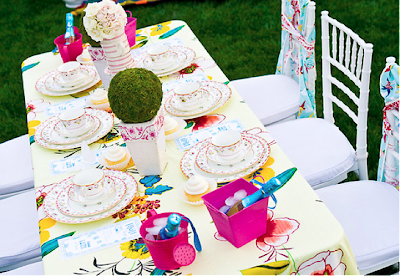 Boho chic + whimsical, these colors are very summery, more ideas for dining al fresco! I just had to comment on that beauty of the styling. It is so beautiful! It is looking so beautiful. I have no words for it. It is look like a barbie doll's dining table. So sweet!